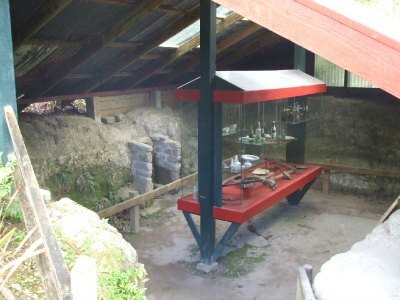 The Buried Village of Te Wairoa, as an attraction in Rotorua, is New Zealand’s mini version of Pompeii, you know, the Roman city buried when Mt Vesuvius erupted. Mt Tarawera? Is our volcano. Te Wairoa itself would have to be the birthplace of tourism in New Zealand. Wealthy visitors would come from all around the world to see, photograph, paint, sketch and bathe in the mineral waters at the nearby famous Pink and White Terraces, touted at the time as being the eighth wonder of the world. I really have to give it to the travellers back in those days. Imagine travelling across the ocean for 4mths, arrive in Auckland then having to boat/coach to get to Rotorua followed by a buggy to Te Wairoa before getting onto a whaleboat to cross Lake Tarawera to get to the terraces on Lake Rotomahana. Phew. And we think we are intrepid huh? And can you imagine the clothes they would have been wearing. Crinoline dresses, corsets, dainty high-heeled lace-ups and the requisite hat for the ladies; bowler hats and starched shirts for the men. It must have been so uncomfortable; they would have loved our gear now. Because of these visitors, Te Wairoa became a bustling village boasting a population of about 150, two hotels, a hall, stores, the Hinemihi meeting house, a church and school as well as both European and Māori houses . The Tuhourangi people, a sub-tribe of Te Arawa, owned most of the land in the Te Wairoa area which also expanded out to include the terraces. With astute leadership, they cashed in big-time on the lucrative tourist trade. Cultural performances, carriage across the lake, food-stops on the way, the taking of photographs, paintings etc. all attracted charges. Visitors needed to be wealthy. Members of the tribe could earn up to ₤4,000 annually, that was a huge amount in those days. But, there always seems to be a downside. Problems began to creep in. Alcohol abuse, prostitution, illnesses they had no immunity against, crops not attended to. It's said that Mt Tarawera erupting was payback for the tribe leaving behind the old ways. What a retribution. Over 120 people were wiped out and Te Wairoa was decimated. 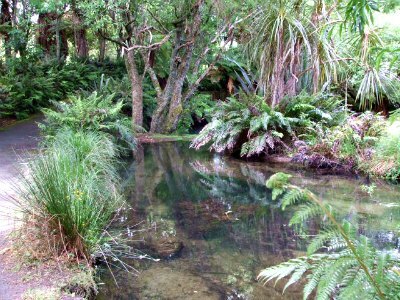 What’s left of this once thriving village is now a tranquil setting of park-like grounds with carefully excavated remains, like the stone storehouse, māori waka (canoe) and blacksmith’s workshop. From these relics and the surrounding landscape you get a sense of just how much mud and ash fell on the night of 10 June 1886. 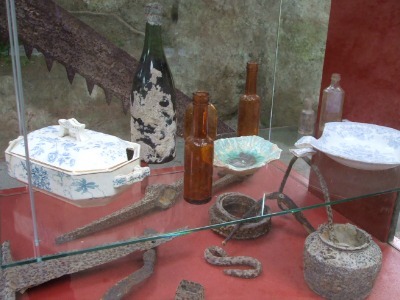 The Buried Village Museum (award winner) houses a lot of objects excavated from the site. There's also interactive and audio visual displays in addition to a kiddies room. They get to do their own thing and learn at the same time. Speaking of kiddies, my family used to go out to Lake Tarawera for swimming when my brothers and I were young. We would love stopping at the Buried Village because of a sewing machine stuck up high in one of the trees (from the eruption). We’d all rush to see who could spot it first… as you do when you’re a kid. The tree had to be cut down in the end because it was rotten but the sewing machine and the part of the tree it’s stuck in were kept and are now housed in the museum. I didn’t know for the longest time that the Buried Village is privately owned. A couple by the name of Reg and Vi Smith bought the land and a little cottage on it in 1931 and began the task of excavating. In addition to this, Vi ran the tearooms. The family is into it’s 3rd generation now, still very much hands on with developing and preserving this award winning heritage site. Periodically they carry out excavation work as well. It would take a good 1hr-1½hrs to go through the museum and grounds. Apart from what I have mentioned above the family have built depictions of a pioneers house, barracks and blacksmith’s to show how people lived at the time. In-house tours are carried out regularly by guides in Victorian period costume or, you can hire a mozivision, that’s a multi media tour guide to carry round with you. It's a scenic 15-20 minute drive out to the village, past the Blue & Green Lakes. Alternatively you may like to take one of the tours that includes this stop. Either take your own food and drink or take advantage of Vi’s Tearooms. The devonshire scones with cream and jam are so yum, and they have a great selection of muffins along with sandwiches etc. Sit inside or wander round the tearoom looking at all the old photographs, they’re really interesting. There is plenty of parking available as well as toilets. 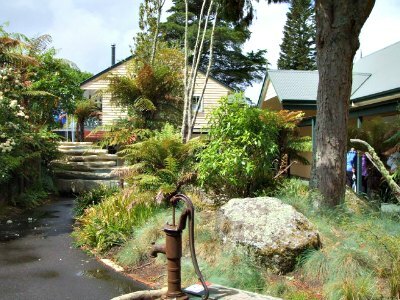 The grounds are wheelchair friendly apart from a side route to the Wairere Falls which has steep steps. All ages. Disabled people can easily access the tearoom, museum and immediate outside area. If a wheelchair is being used, the grounds around the excavations are rolling with gravel paths and some stairs.